Managerless Luton Town controversially came away with a win at Exeter City. Paul Benson scored in the 10th minute of stoppage time after Exeter felt the forward kicked the ball out of goalkeeper Bobby Olejnik's hands on his way to getting the winner. Cameron McGeehan's penalty and a goal from Danny Green gave the Hatters a two-goal lead at half-time. But Tom Nichols' stunning free-kick made it 2-1 before Alex Nicholls levelled with a header. The match was the first since Luton sacked John Still earlier this week, with the win ending a four-game losing streak. The Hatters move up to 13th place in League Two, one spot behind Exeter. "I really enjoyed the build up to the game. After a tough week, it is always difficult no matter what the circumstances are. I'm not looking any further ahead than Wycombe right now, we will train properly and I will prepare them like we always have." "I thought, first half, we executed the game plan brilliantly. Exeter caused us problems, they have only lost at home once this season, so fair play to our lads. They stuck at the game in difficult conditions, and maybe we could have won 4-2 in the end." Match ends, Exeter City 2, Luton Town 3. 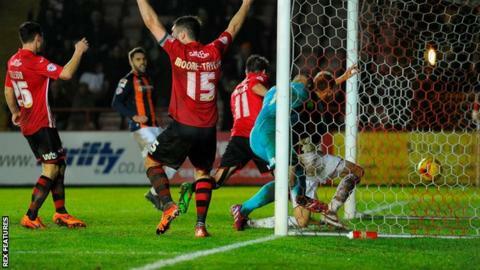 Second Half ends, Exeter City 2, Luton Town 3. Cameron McGeehan (Luton Town) is shown the yellow card. Goal! Exeter City 2, Luton Town 3. Paul Benson (Luton Town) right footed shot from very close range to the centre of the goal. Corner, Luton Town. Conceded by Robert Olejnik. Corner, Exeter City. Conceded by Scott Griffiths. Attempt blocked. Arron Davies (Exeter City) right footed shot from outside the box is blocked. Corner, Exeter City. Conceded by Sean Long. Attempt saved. Clinton Morrison (Exeter City) left footed shot from the centre of the box is saved in the centre of the goal. Substitution, Luton Town. Jack Marriott replaces Danny Green. Corner, Luton Town. Conceded by Jordan Moore-Taylor. Olly Lee (Luton Town) wins a free kick in the attacking half. Corner, Exeter City. Conceded by Mark Tyler. Attempt saved. Alex Nicholls (Exeter City) right footed shot from the centre of the box is saved in the bottom right corner. Corner, Exeter City. Conceded by Cameron McGeehan. Corner, Exeter City. Conceded by Olly Lee. Goal! Exeter City 2, Luton Town 2. Alex Nicholls (Exeter City) header from the left side of the six yard box to the top left corner. Assisted by Lee Holmes with a cross following a corner. Corner, Exeter City. Conceded by Magnus Okuonghae. Attempt saved. Jordan Tillson (Exeter City) right footed shot from outside the box is saved in the bottom left corner. Scott Griffiths (Luton Town) wins a free kick in the attacking half. Paul Benson (Luton Town) wins a free kick on the right wing. Substitution, Luton Town. Josh McQuoid replaces Craig Mackail-Smith. Goal! Exeter City 1, Luton Town 2. Tom Nichols (Exeter City) from a free kick with a right footed shot to the top right corner. Joel Grant (Exeter City) wins a free kick in the attacking half. Substitution, Luton Town. Scott Griffiths replaces Jake Howells because of an injury. Attempt blocked. Ollie Watkins (Exeter City) right footed shot from the centre of the box is blocked.